Should I do the upgrades for Wordpress and my plugins? I was talking to the son of a client one day, a younger guy who is really into technology, does some web design as a side job, and he said to me he didn’t run the updates on his mom’s site because he’d always heard that would break the site. Another time a friend and I were at the park with our kids, and she mentioned that her blog (for her company) was constantly getting spammed. I told her I could fix that if she gave me a login. She did and when I logged in I saw that nothing had been updated in a long time. A really long time. For my friend, I immediately backed up her site, ran all the updates, and fixed her spam problem as well and gave her the following advice. Her developer, someone she hired to make her website, told her not to run updates because it might break her site. Can running an update break your site? Yes, that can happen. But if you use reputable plugins (read this post about how to evaluate a plugin), solid themes and frameworks, and backup your site every day, you don’t have anything to fear from running an update. Security. One of the main reasons plugin, theme, and core updates are pushed out is to address any security concerns. If you don’t update, you are at a major risk for being hacked. And the longer you go without updating, the bigger that risk becomes. New Features. Sometimes an update includes nifty new features that would be useful for your website. You don’t want to miss out on something that could enhance your website because you’re too busy to press the update button. Bug Fixes. People who make plugins and themes are fallible humans and make mistakes. Sometimes those mistakes aren’t evident right away and don’t emerge until the software is used in certain ways. The best versions of software comes from finding and fixing bugs. When you don’t update your software, you miss getting any bugs fixed. Compatibility. 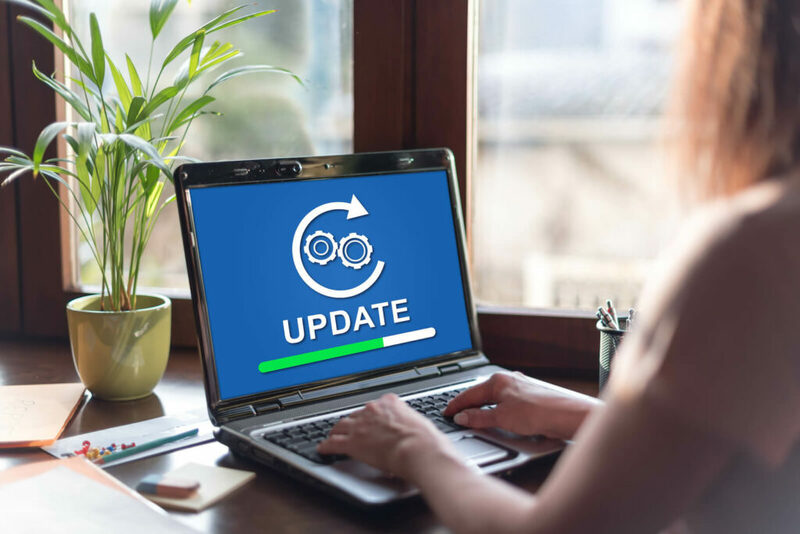 Updates often are pushed out to make sure that your software continues to be compatible with the programming language used on your server. A lot of older plugins won’t work with older versions of PHP (versions before 5.6) so you need to run the updates to keep your software actually working properly. Speed. Sometimes an update will make your software more efficient or work better, which can speed up your site. How often should you run updates? As often as they come out, but with a caveat. Updates for plugins, themes, and core do not get released at the same time on the same date, so there are often updates for various items in your site multiple times every week. That’s a lot of work to remember to keep checking for updates. If you plan to keep things up-to-date on your own, then I recommend you login to your site at least one time per week to look for and run any available updates. That should be frequent enough to prevent any issues. However, if you get any notifications or see any news about an update that needs to be run due to a security breach, then I recommend you login right away and run that update. What if running an update breaks the site? Like I said, if you are using quality plugins and themes, this is unlikely to happen but it does happen. In this case, you just revert back to your last backup because you are backing up your site every day. EVERY DAY. A staging site is just an exact clone of your website, hidden from search engines, that you can use to test out updates and other changes before performing them on the live site. Do you need one? Perhaps. Is your site big? Does it have a lot of traffic? Would it being out of commission for an hour cost you a lot of business? In those cases, then definitely, having a staging site would be useful. However, if you aren’t making massive changes on your site all the time, if you aren’t changing or adding software that could affect how it runs, and if you run backups every day (every day!) then you can probably get by without one. Did you know that we offer support plans that literally takes care of all this for you? That’s right, we will login to your site every week, run any updates for you so you never have to think about it. We also take backups of your site everyday and store them for 90 days as well as run security scans daily to make sure your site is secure. Want to know more? Check out all the options we have for support plans.